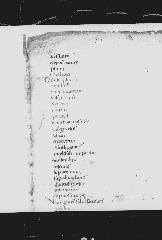 The following list includes all Old Latin manuscripts of the latter part of the New Testament (VL 50–96), with hyperlinks to sets of online images. It is based on the list in The Latin New Testament: A Guide to its History, Texts, and Manuscripts. The content is summarised as follows: e (Gospels/Evangelia), p (Pauline Epistles), a (Acts), c (Catholic Epistles), r (Revelation/Apocalypse). This site also hosts a list of gospel manuscripts, and a concordance of sigla for Old Latin manuscripts in different editions.
. It should be noted that Old Latin forms of certain biblical books are also found in manuscripts in other sections of the Vetus Latina Register, e.g. VL 109 and VL 135. Acts of the Apostles. Copied in Sardinia or Rome in the sixth or seventh century. Bible and other texts (New Testament eacrp, including Laodiceans). Copied in Bohemia (probably Podlažice) between 1204 and 1227. Milan, Biblioteca Ambrosiana, B. 168 sup. Two martyr narratives from the Acts of the Apostles. Copied in North Italy in the second half of the eighth century. Fragments of Acts and the Catholic Epistles. Copied in Italy in the sixth century; palimpsested in Bobbio in the eighth century. New Testament (eapcr). Copied in Roussillon in the second half of the twelfth century. Portions of Acts, Catholic Epistles and Revelation. Copied in the fifth century, probably in Italy. Palimpsested in the seventh or eighth century in France. Lectionary (Liber comicus). Copied in Silos in the middle of the eleventh century. Lectionary containing readings from the Old Testament and Acts of the Apostles. Copied in the eighth century, probably in North Italy. New Testament (epacr) including Laodiceans. Copied in Bohemia (possibly Tepl) in the second half of the fourteenth century. Lost since the 18th century. Bible. Copied in Burgundy in the second half of the thirteenth century. Sarriá (Barcelona), Colegio Máximo S.J., s. n.
Lectionary with Acts and Epistles. Copied in Catalonia in the thirteenth century, but destroyed in the Spanish Civil War. New Testament (epcra including Laodiceans) and hagiographical material. Copied in Ireland, probably Armagh, in 807/8. Latin Bible (eacpr including Laodiceans). Copied in Santa Maria de Ripoll in the middle of the eleventh century. Acts of the Apostles. Copied in England in the first half of the twelfth century. 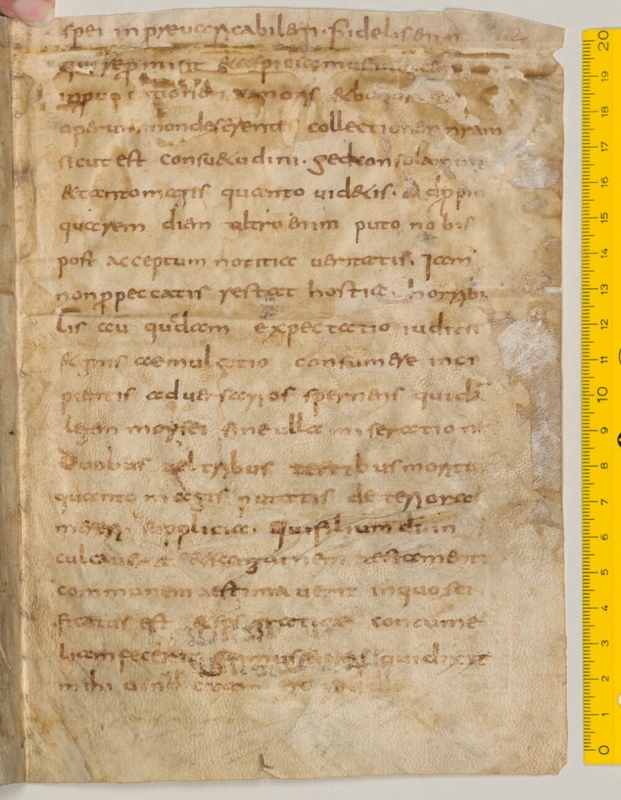 iv) Göttweig, Stiftsbibliothek, s. n.
Fragments of the Pauline and Catholic Epistles. These fragments have two origins. i–iv) are 28 folios from a manuscript of the Pauline Epistles copied in the second half of the sixth century, probably in Africa. v–ix) are 5 folios comprising replacement leaves for Paul and parts of the Catholic Epistles, copied in the first half of the seventh century, probably in Spain. Pauline Epistles, Catholic Epistles and Revelation Copied in northern France, probably Reims or Cambrai, in the second half of the ninth century. Epistle of James and other texts. Copied in Corbie around 830. Caroline minuscule script. Remains of a Latin Bible (epcar). Copied in the seventh century, possibly in Toledo. 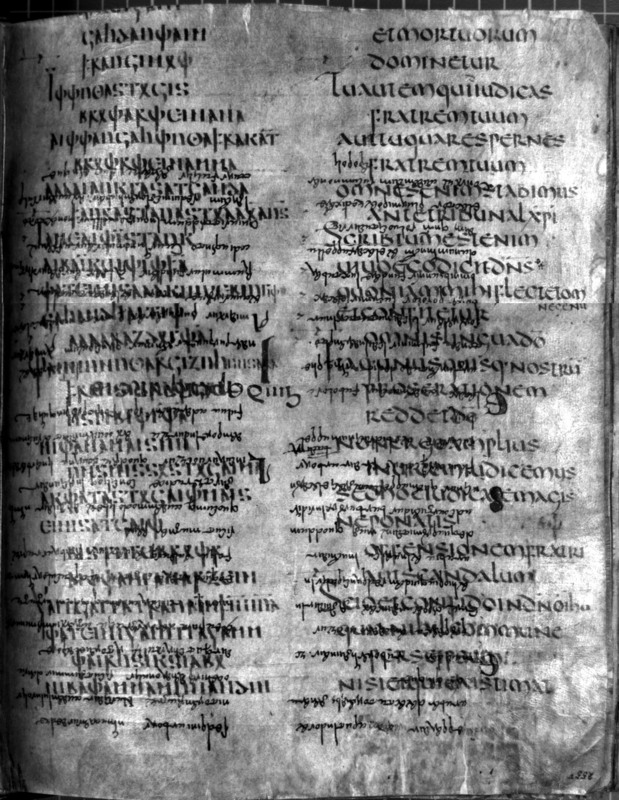 Palimpsested in the tenth century with Rufinus’ translation of Eusebius’ Historia ecclesiastica. Lectionary (Liber comicus). Copied in Toledo in the ninth century or later. Lectionary (Liber comicus). Copied between 1065 and 1071, possibly in León. Lectionary (Liber comicus). Copied in San Millán de la Cogolla in 1073. Lectionary (Liber comicus). Copied in Septimania around 800. Lectionary (Liber misticus). Copied in Toledo around 1200 (although some sources give a ninth century date). Lectionary (Liber misticus). Copied in the tenth or eleventh century, possibly in Silos. Readings from Acts and Revelation. Copied in the tenth century, either in the Near East or North Africa. Pauline Epistles. Copied around the middle of the fifth century, probably in southern Italy. Pauline Epistles. Copied in the ninth century, possibly in France, from VL 75. Pauline Epistles (without Hebrews). Copied in St Gall in 860/70. Suffered water damage in 1945. Pauline Epistles. Copied in Reichenau in the last third of the ninth century. Portions of Romans. Copied in North Italy at the beginning of the sixth century; palimpsested in North Italy in the eighth century. A fragment of Romans. Copied in the seventh century, probably in Italy. (v) Paris, Bibliothèque Nationale, latin 653, foll. 289v–292v. A fragment of Hebrews in a copy of Pelagius. Copied around 800, possibly in Monza. A fragment of Hebrews. Copied at the beginning of the ninth century, probably in Germany. i) Mengeringhausen (Waldeck), Stiftsarchiv, s.n. A list of lections quoting Pauline verses. Copied in North Italy around 750. A fragment of Ephesians. Copied in the fourth or fifth century, probably in Egypt. Fragments of the Pauline Epistles. Copied in North Italy (Monza or around Milan) in the middle of the ninth century. 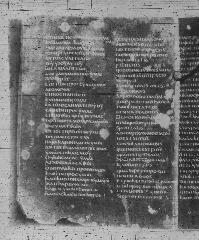 Fragments from a Pauline lectionary. Copied in the second half of the eighth century, probably in Italy. Part of a Latin Bible with Prophets and New Testament (parc). Copied in western Germany in the ninth or tenth century. The text throughout is Vulgate apart from folio 21 (2 Corinthians 7:3–10:18). Anonymous commentary on Paul (AN Paul). Copied in Saint-Amand around 800. This siglum has not been assigned. Bible with Old and New Testament (epcar, including Laodiceans). The number VL 91 refers to the marginal glosses, while VL 133 is assigned to the Old Latin forms of certain Old Testament books. Copied by the priest Sancho in 960, probably in León or Valeránica. Three-volume Bible with Old and New Testament (epcar). Copied in León in 1162. This is a copy of VL 91 with some corrections towards the Vulgate. A collation of certain books and marginal glosses in VL 91 made in a printed Vulgate of 1522 by Bishop Francisco Trujillo in preparation for the Sixtine Vulgate. It appears not to contain any New Testament material and is not cited in the Vetus Latina edition. A collation of biblical glosses in a printed Vulgate of 1478, apparently made in 1561 from two manuscripts now lost: an eighth-century Gospel book from Oviedo Cathedral and the tenth-century Valvanera Bible. Two volume Bible, with the Old and New Testaments (eapcr). Copied in San Millán de la Cogolla in the twelfth century. Part of a two volume Bible. Copied in Calahorra in 1183. Only the first volume, containing part of the Old Testament, is preserved. 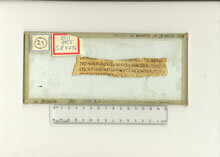 Fragments of a lectionary with an Old Latin lection in Acts. Copied in the twelfth century.